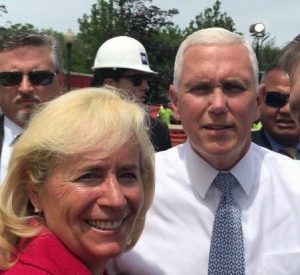 Michigan Republican Mary Treder Lang poses with Vice President Mike Pence. Lang is an unabashed supporter of Pence's "voter suppression commission." ‍Donald Trump carried the State of Michigan by less than 11,000 votes in 2016. Michigan Republicans have regularly engaged in massive purges of voter rolls in recent years. When considered together, it is certainly possible to conclude that Trump might not have won Michigan -- and perhaps the White House -- if not for Michigan Republicans engaging in voter suppression techniques like purging voter rolls on a regular basis. But Michigan's Republican candidate for Secretary of State (SOS) took that logic a step further recently. Keep in mind that Michigan was the closest state in the 2016 election. Donald Trump only won by roughly 10,000 votes. Having a Republican SOS who is nakedly committed to tilting elections to the GOP could have far-reaching effects in the future. This wasn’t a gaffe. Lang threw out this conspiracy theory in the May 2018 Lapeer Tea Party debate and said “God bless” current GOP Secretary of State for giving us Trump. That's the bad news. The good news is that Democrats have perhaps the most qualified SOS candidate in the country in Jocelyn Benson. With your help, Benson can defeat Lang in November and start moving Michigan toward a fair voting process in 2020 that just might result in a different President of the United States. Click HERE to donate to Jocelyn Benson. For more information on how you can help defeat other Republican candidates in Michigan, click HERE.